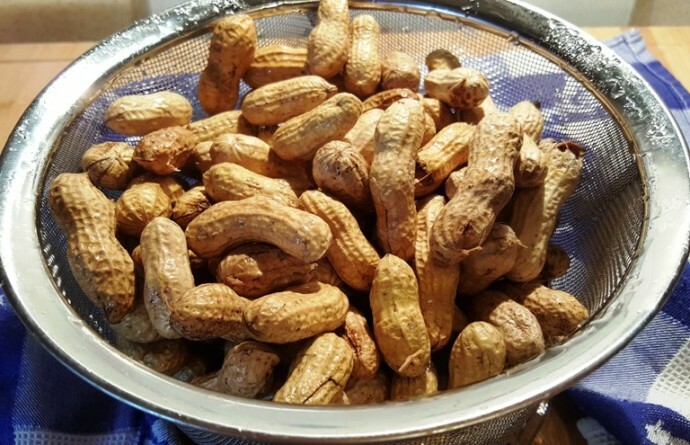 Pressure Cooker Southern Style Boiled Peanuts make a wonderful snack. They are soft, like a bean and salty like tears of joy! I was born in Miami, which, at the time, was like New York, South Edition, but we did have a little bit of Southern influence in various parts. Homestead, which is now all built up, was quite rustic for many years. Hurricane Andrew destroyed the City and it’s now very sheshe. My parents were from New York, many restaurants were owned by New Yorkers and the food took on a New York influences, which is definitely a good thing. We have/had great pizza that tastes the same as from the best New York pizzerias, great delis, bagels and great Chinese food. Things in Miami were quickly changing in the late 1970’s and Cuban food restaurants were popping up all over the place. I love Cuban food and learned how to make many dishes. I start out my day with a Cordadito, which is a standard espresso shot, sweetened and topped off with steamed milk. But I digress. Making Pressure Cooker Southern Style Boiled Peanuts in an Pressure Cooker, takes a fraction of the time it takes to make them on the stove or in a slow cooker. This RSVP Stainless Steel Basket fits nicely inside all brands of electric Pressure Cookers. For six quart Pressure Cookers, you will need to pry off the handles, which is simple. 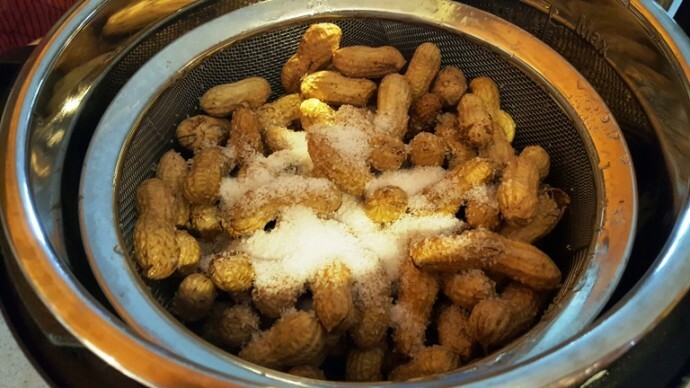 I prefer sea salt with my boiled peanuts, but Kosher salt is fine. I sometimes use Rachael Ray’s Applewood Smoked Sea Salt when cooking the peanuts, which is also delicious on rice. We use 1/2 cup of sea salt in this house, but if you don’t want as salty a taste, just use a little less. 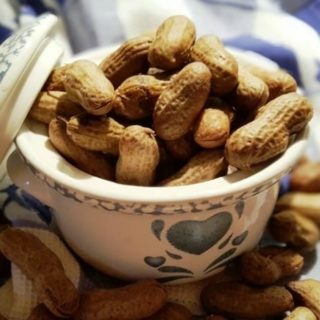 Pressure Cooker Southern Style Boiled Peanuts can be made with your favorite seasonings and spices, so have fun and play around. Start with 55 minutes and if you need more time, you can always add more time. Some people like a softer peanut and cook for two hours. I like mine a bit less mushy. 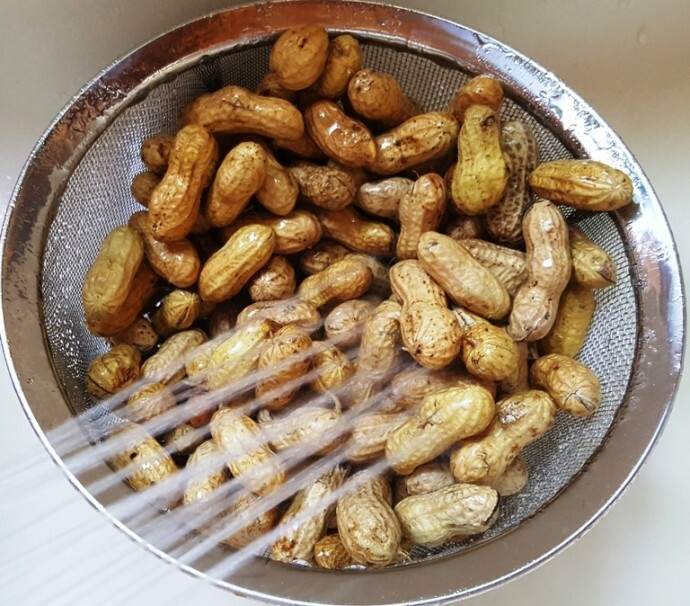 I like to leave the peanuts in the cooking water and take them out with a strainer. Brown bag it for your guests. Serve in a brown paper lunch bag like you see at the roadside stands. If you want to spice things up, try my Asian Style Chinese Boiled Peanuts. Cook on High Pressure for 55-90 minutes. When Beep is heard, allow all pressure to release naturally and let sit 30 minutes. If peanuts are too hard for your liking, just add some more time. Cook on HIGH for 10 hours. Depending on your preference, the Pressure Cook time will vary. The average is 55-120 minutes. Start with 55 and then go from there. I like 65 minutes and my husband prefers 75-100 minutes for a softer Boiled Peanut. 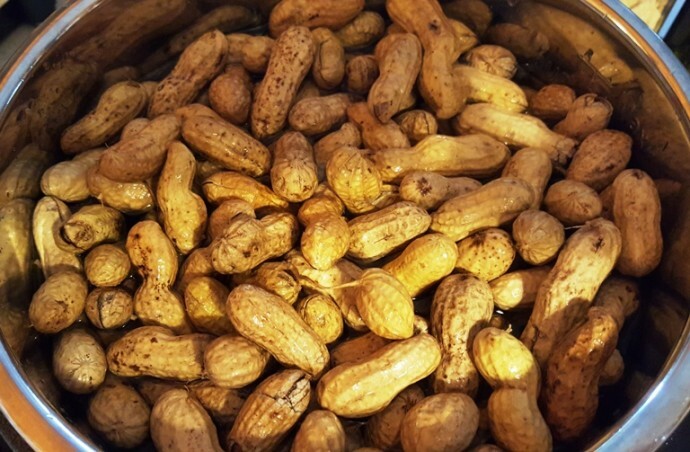 PIN this Pressure Cooker Southern Style Boiled Peanuts! Oh my goodness, thank you for this! I’m from South Carolina and have moved around some, but Iowa is the first place I’ve lived where it’s almost impossible to find boiled peanuts (though I’ve bought them in pouches at World Market–exotic!–and ordered them in cans from Amazon). Just last night I was wondering if you could do them in the Magic, um, Instant Pot. Can’t wait to try this! Boiled peanuts are wonderful! Let me know how you like them after you make them in your Pressure Cooker. not my thing.. wanted to see what the fuss was.. but ICK..guess I don’t have the acquired taste. 80 minutes on high with 30 minutes natural release was far too much for me with my Instant Pot… the peanuts came out extremely mushy. I prefer a toothier texture, similar to edamame, so 60 minutes with 10 min natural release works for me better. Did you use fresh green peanuts or raw peanuts? The green cook faster than raw peanuts. I like the edamame texture too. Just bought a bushel of green peanuts (I live in Georgia, they are a staple here). Also just bout a new 10 quart pressure cooker. Time to play mad scientist. Of course the bulk of that bushel is being boiled in the turkey fryer and will be divided and frozen for the winter. My boyfriend brought home some fresh raw peanuts…..getting things gathered for our snack tomorrow for FooTBaLL watching. Thank you for the recipe ?. Dawn, please look at the recipe at the bottom of the post. Do you ever use the 10 quart pressure cooker? I’m going to try your boiled peanuts. Do you think this would work in the summer with fresh green peanuts? I used a one pound bag of surprisingly clean raw peanuts. They were kinda on the larger size. I ran the pressure cooker twice for an hour allowing it to cool both times before they got soft. This was my first attempt ever to “boil peanuts”. I will definitely do it again. They were much tastier than I’ve been able to purchase precooked. I am glad you enjoyed the peanuts. I am in Canada where can i buy a kit like this here? We have always seen boiled peanuts in our travels but had never tried them until I made these yesterday. Very tasty snack. Question about when to add the cajun or barbecue seasoning. Does that go into the water along with the salt or do you sprinkle it over the cooked peanuts. Bought two bags so may want to experiment. Thanks! Love your recipes by the way! Trying the PC boiled peanuts today….Can’t wait to see how they taste. 🙂 Thanks! Wonderful! Thanks for sharing. Since peanuts are not in season my raw peanuts were a little dry. I did high pressure for 90 minutes and NR all the way. Had my first boiled peanuts when visiting Tampa, bought from a Haitian at a flee market. Best ever! A Carolina friend here in Colorado does them with a ham hock. That was so good. I tried some, not as good as Floridas and wondering about freshness. Would amazons be good? When is their best season? How is the best way to store them after cooking? Should they be spread on a rack to cool? How long do they last? I have never done this before. Thanks for the recipe!! Thanks for sharing! I’m from Homestead and live in the Midwest now. I miss the being an old to get the wide variety of foods there was to offer in our little town! Can’t wait to try cooking peanuts in my pressure cooker with smoked sea salt. Thanks, Jill! I made this today, with fresh green peanuts. I’m glad I saw in the comments that green peanuts cook faster that raw (I had forgotten that the packaged raw ones are semi-dried). I think you should add that note to the recipe! My pound of large green peanuts fit in my 3-quart IP and were well cooked with 65 minutes and NPR. By the way—your Amazon link took me to raw out-of-shell peanuts. I’ve had your book on order for months and can’t wait until it ships!! Do you think one could do the same thing except with sunflower seeds and them roast them? Would it be the same timing? Can’t wait to try this. I’m from Hawaii and we have a similar version that uses sea salt and an a whole Anise pod. Gives it a distinct flavor!